If you’re a newcomer to Kingdom Hearts 3, you may be intimidated to get into the series, due to its reputation for excessively complicated storytelling and being hard to follow even for devoted fans. But don’t worry, you’ll still enjoy it — you won’t have a goddamned clue what is going on, but you don’t have to. The truth is, readers will inevitably fall into two camps: either you’re a fan of Kingdom Hearts and have been waiting a good chunk of your life for this game, or you’re new blood (or a casual fan of previous entries) and have no idea what the fuss is all about. If you’re in the first category, let’s be honest with each other: you’re already playing the game and you don’t care if I say it’s dogshit on a cracker (but don’t worry — it’s not). And, considering it’s been seven years since the last major game in the series and 14 damned years since Kingdom Hearts II, I don’t blame you one tiny little bit. You’ve waited long enough — enjoy being with Sora, Donald, and Goofy in all their glory once more. Considering the amount of time that’s passed between big, splashy entries in the Kingdom Hearts series, and the fact the game has officially jumped to the Xbox for the very first time (nothing like platform infidelity to recoup years of development costs), I suspect there are quite a few of you new keyblade wielders in our midst. I’ve been playing Kingdom Hearts for over a week now. My story progress is admittedly slow, if only because I’m enjoying myself so thoroughly in each world that I just want to stay and spend time there, to live in the game. I’ve played bits and pieces of the numbered Kingdom Hearts games, but honestly, I have a very small fund of attention to allot to JRPGs when I play them on my own time. So Kingdom Hearts 3 is the first occasion when I’ve sat down and endeavored to really dig into the series. Better late than never, right? The game makes a token effort to let the player into the story gently, but the opening cutscene only vaguely alludes to the in-game lore, and does nothing to help explain the nuances of what you’re about to see. So those of you who may have thought the game would help you play catch-up… yeah, don’t bet on much. Yes, you could play the re-released Kingdom Hearts 1.5, 2.5, and 2.8, but that’s several games of catching up to do, not to mention a three-hour long cutscene movie covering 358/2 Days. I don’t know about you, but I have stuff to do, like eat and sleep. I had so many questions from the get-go (beware: I guess these count as very minor SPOILERS). Who is Aqua, and why do I care about her? How many hearts does poor Sora have stuffed into his chest cavity? What’s in the black box? What is the power of waking, and why doesn’t Sora have it anymore? But, about twenty minutes or so after I asked each of these questions, I found I no longer required the answers. The game is so joyful and sure of itself that knowing the minutiae of the lore no longer seems important. And, more to the point, the game made me want to know more about the story, and to catch up on what I missed. This is a game that could very easily have closed itself off by being too obscure, or by talking down to the player by over-explaining stuff. But it doesn’t, instead relying on the likable protagonists to draw the newcomers into the story. If you think about it, there are lots of games that bend over backwards to make sure they’re appealing to the largest possible audience. This can take many forms — these days it usually manifests as a battle royale mode. It can mean slowing the story down by taking too long to explain what’s happened in the world up to this point. I had this problem with Shadow of the Tomb Raider, in that the only way we were drawn into Lara’s world was by her slowly explaining to Jonah (or in her journal) about Trinity and how they wronged her and her father. It’s very refreshing to play a game that specifically doesn’t mold itself into something the mass audience will devour. I don’t just mean, “KH3 doesn’t have battle royale, rejoice.” I mean that, while it’s not completely obscure, it’s not a game that compromises itself to make sure every player has a point of entry. Instead, the game makes up for it by being a blast to play and for indulging in a massive amount of fanservice. The recognizability and appeal of the Disney characters grounds the narrative’s craziness. Any kind of mumbo jumbo in the world sounds palatable when it’s spoken by Mickey Mouse. And that’s the main reason the game, even with a dearth of explanations, still works even if you don’t know the full story. It’s kind of like the Marvel films — even if you start in the middle, you’ll still enjoy them. You may not be able to catch all the subtleties or easter eggs, but you’ll still be able to enjoy them based on the quality of the storytelling and performances. You care about Aqua because Mickey Mouse does. The box only matters because the villains really care about it. And Sora’s lost power is just a plot MacGuffin, and you’ll care that he doesn’t have it only because he, Donald, and Goofy are willing to bust their tails trying to get it back. It’s not about knowing their whole life story — it’s about the game drawing you in with likability and enthusiasm. So to those who haven’t played Kingdom Hearts before: no, you don’t have to spend $100+ on the previous games and weeks of playtime catching up with the story if you don’t want to. 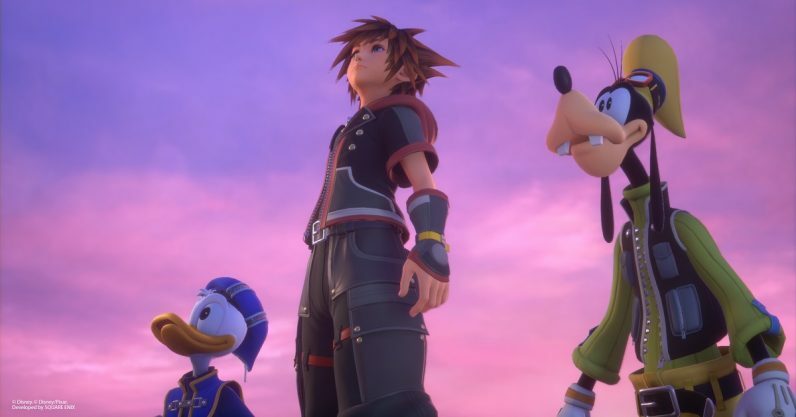 Just go in prepared to be charmed, and Kingdom Hearts 3 will take it from there.